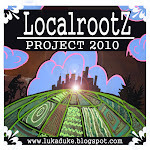 Localrootz Project: Day.... I'm losing my Mind ! Day.... I'm losing my Mind ! Ok ok... so I feel I need a quick explanation (I no longer have the internet at home so I am updating via a coffee shop) as well as letting my readers know Im alive! Ive come to the conclusion that the day to day "look what I ate today" has driven this blog into the ground. It lasted 200+ days before the piles of day to day life became to cumbersome to ignore. I have decided to revamp the blog and limit my posting to an occasional update of great new local food items, recipes or happenings in and around the Portland area. I am fully engulfed in my art and will be vending at a few holiday sales in the upcoming season.... stay tuned for a fresh new approach to the LocalrootZ Project !